Passions truly come in all shapes and sizes. As a kid, I was drawn to the warm glow of the old neon signs that remained in the early 1970's. 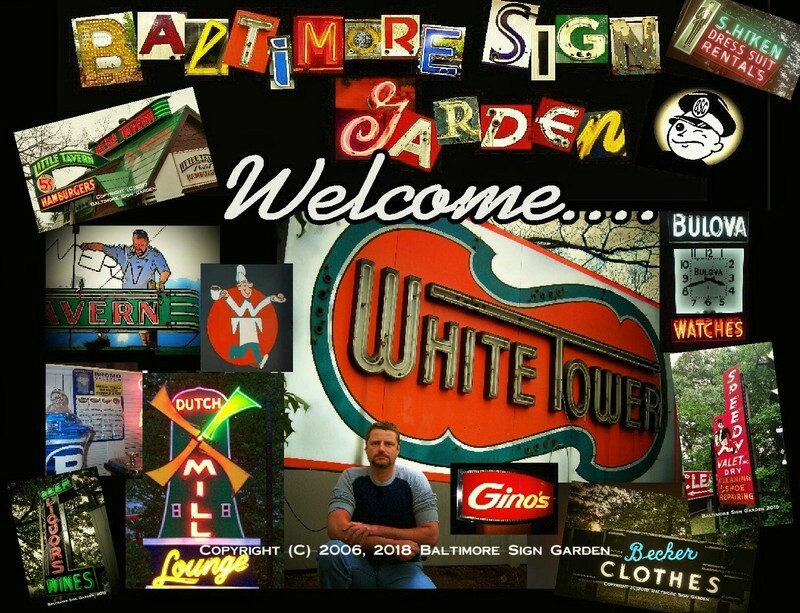 By age 20 I had turned my interest into a career at the longest established sign company in Baltimore. In the mid 1980's, I observed that what remained of the old neon beauties were being removed. The tattered and worn old signs retained their charm and were crafted like few signs today. In Baltimore, a city ordinance had been in effect for many years, giving business owners a decade or so to completely remove swinging signs (usually hanging on poles over the sidewalk). With few exceptions, most now had to come down. Other old signs branded long established banks, merging or closing after the savings and loan debacle of 1985. There were old Firestone signs, 1950's shopping centers undergoing their first renovation. Old family businesses who have reached the end of the road. Few people noticed the old signs gradually disappearing. They would be cut-up on the 'back lot' and scrapped. The first few signs I saved were take-downs from my company. I then went on a quest. I inventoried and photographed the remaining signs in the area, documenting them and interviewing their owners. Most old signs in good working order had owners that appreciated their old signs. Times change and corporate America replaced the smaller, family run business. When the time comes, I step in to rescue the sign. I often feel like a grim reaper, witnessing the end of an era. I usually meet wonderful people who are honored somebody actually wants to save a piece of their history. Other times I find myself in desolated neighborhoods, whose abandonment gave reason for the old sign to remain. Although my collection now numbers over 40 large neon signs, I still consider myself a rescuer, not a collector. My wish would be for all the old beauties to remain on the streets for everyone to enjoy. The collection is now set up on a park-like acre in Anne Arundel County, Maryland. The restorations continue, one sign at a time. NEWS....The collection was featured in the August 2008 BALTIMORE MAGAZINE, and the October 2010 edition of MARYLAND LIFE magazine.